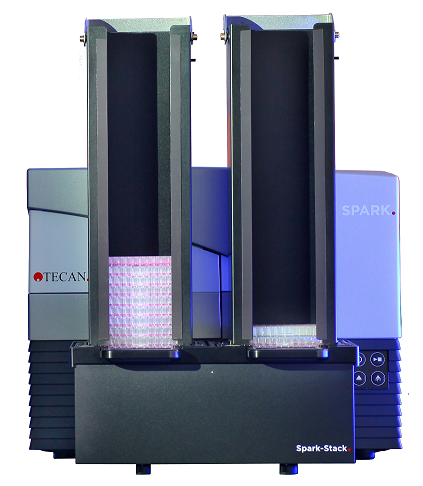 Tecan’s Spark multimode reader can now provide walkaway processing of up to 50 assay plates per run with the addition of the new Spark-Stack integrated microplate stacker. This versatile and field-upgradeable module is designed to reliably automate plate loading, unloading and re-stacking for non-lidded SLAS-format microplates from six to 1,536 wells. Suitable for assays requiring room temperature pre-incubation steps, the Spark-Stack is equipped with removable dark covers to protect light sensitive assay, such as AlphaLISA, AlphaScreen, AlphaPlex and GFP-transfected cells. Software updates to both SparkControl and SparkControl Magellan provide seamless operation of the Spark-Stack module, helping to streamline laboratory workflows and allowing overnight running for greater productivity.